The short answer is no, those who have been here for years, will know it’s just the wind hitting against the side of the house, or that certain steps creek when you ascend the stairs, mainly because, each house is over 100 years old. Work here long enough you get to know all the sounds and quirks. The answer of “No, the houses are not haunted” always seems to be met with slight disappointment, especially in Haney House. Perhaps the public’s curiosity may have to do with the fact on display is a death mask portrait of Mary Haney, Thomas and Anne Haney’s first daughter that hangs in the parlor. She died in 1886, at the age eleven from diphtheria, and the Haney’s had the painting commissioned from a tin plate photograph to remember her by. Deaths happened often in family homes during this era, and the advent of photography made it so the middle class was able to take a picture and memorialise their dead loved ones. 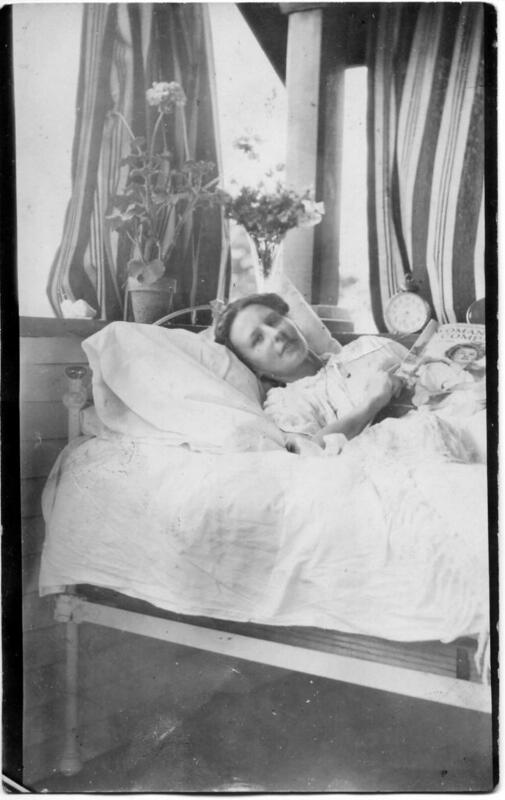 Post-mortem photography – photographs of deceased loved ones – were a normal part of North American and European culture in the nineteenth and early twentieth centuries. Commissioned by families these photographs not only helped in the grieving process, but often represented the only visual remembrance of the deceased and were among a family’s most precious possessions. In the portrait of Mary Haney, you can tell she is not alive as on the left side of the painting there are mountains and water and the right side, darkness, which is to show her journey from life to death. In the Victorian era morality rates among children were very high, and a post-mortem photograph might have been the only image that family would have had of the child. They were more of a keepsake, then anything to do with morality. Often times the children were photographed to appear lifelike, in their crib, or with a toy. If family was posed with the child, typically they would be seated in a chair next to the deceased. Today, the practice of post-mortem (or death mask portraits) photography is essentially non-existent in the Western world. Portrayal like such is seen as sensationalist and quite taboo. This cultural shift could perhaps reflect Western social discomfort with death. Why such words as “morbid” or “creepy” are often used when first entering the Haney House parlor and looking at the portrait. During tours at Haney House we welcome questions, and hopefully in turn, help to educate those on the history of memorializing loved ones through the use of photography. 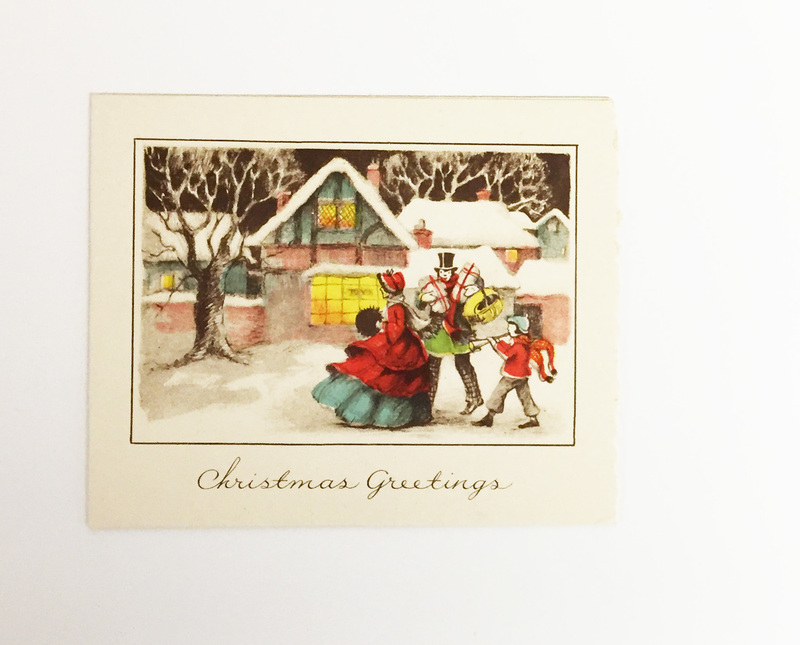 The greeting cards we exchange at Christmas or New Year’s and which are so much a part of our holiday traditions have their origins in England. The custom quickly developed in Europe, especially in Germany, because of a brand-new printing process perfected in 1796. Lithography, as the technique was called, could be used to reproduce large numbers of drawings or texts first drawn on a finely-textured stone. 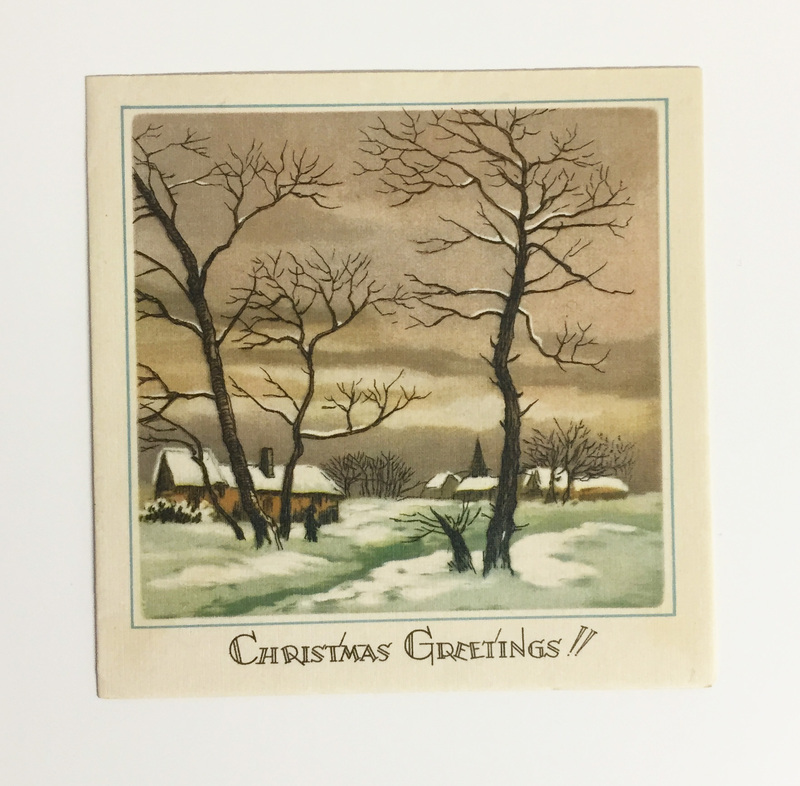 The first postage stamp was issued in England in 1840 and the first series of envelopes decorated with Christmas designs was published the same year. 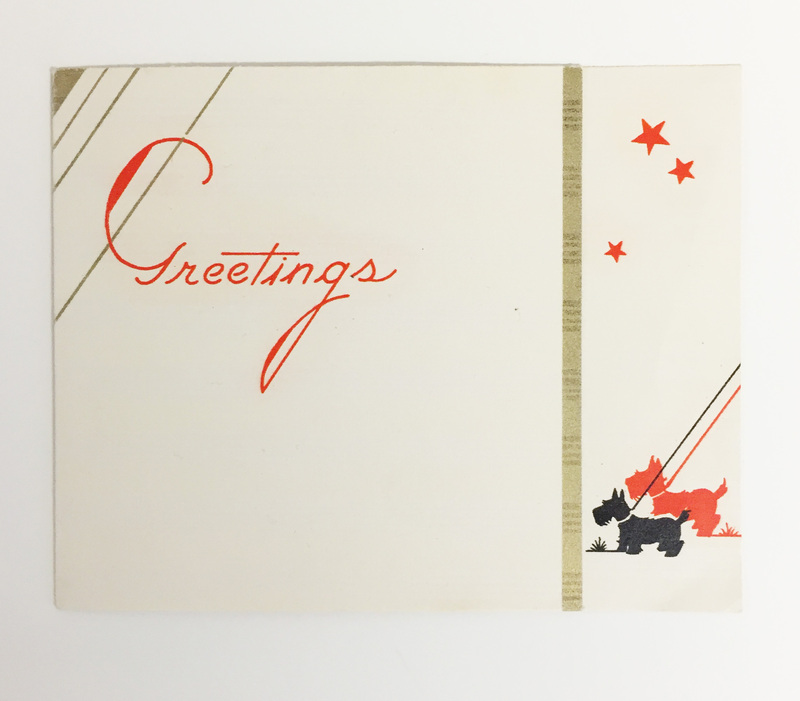 Three years later, the first greeting card appeared. It was produced by John Calcott Horsley for Sir Henry Cole. 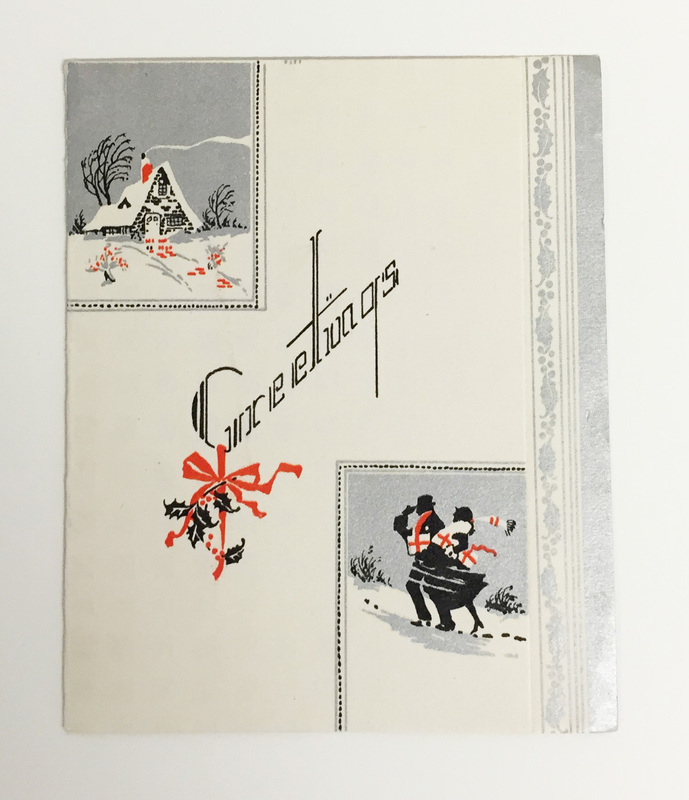 This card depicted a family enjoying Christmas celebrations and lifting their glasses in a toast. The scene greatly shocked temperance workers who quickly denounced it. 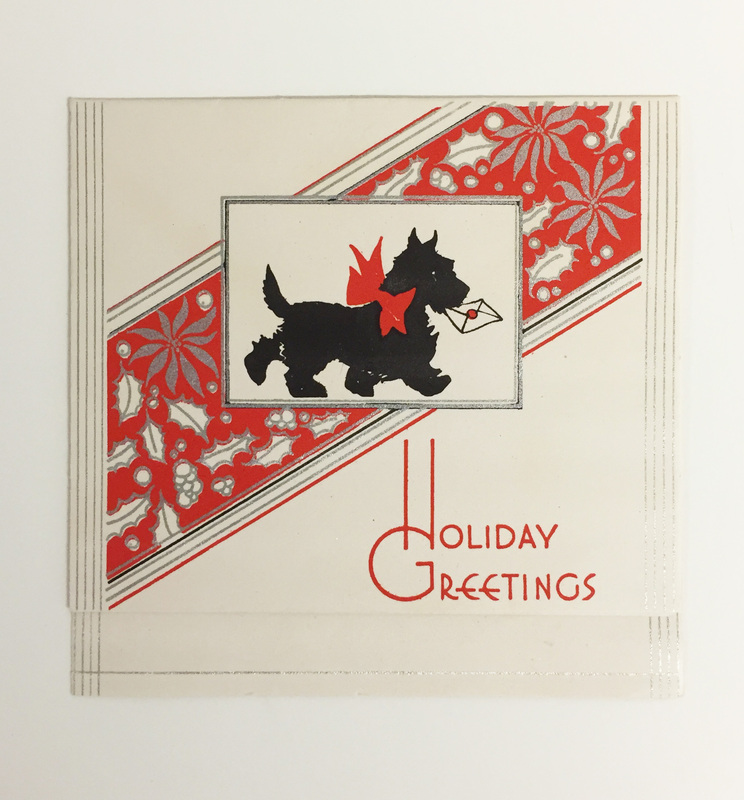 Within the Maple Ridge Museum’s collection are a wide range of Christmas (and greeting) cards, from the late 1920s to the 1950s. Many of the prominent ones from Toronto based William E. Coutts Company, Limited, which started in 1916 as a one man operation, then in 1931 Coutts entered into a “handshake agreement” with Mr. Joyce C. Hall of “Hall Brothers Inc.” to expand his business into America. Their partnership flourished over time, and eventually the Hall brothers purchased 40% of his company in 1948. The Hall Brothers Company became Hallmark Cards Inc. of Kansas City, Missouri, which is one of the world’s largest privately held companies. 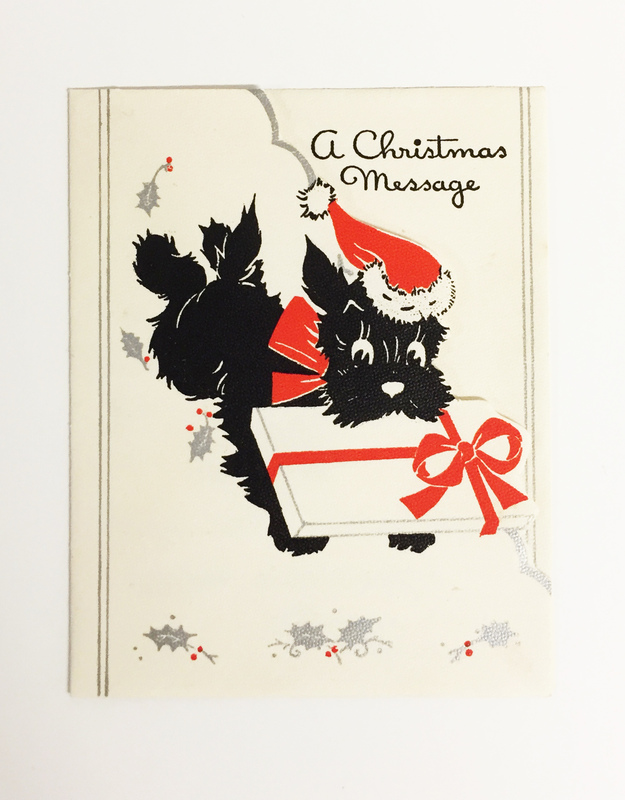 Some of the museums favourite holiday cards produced by Coutts are from the 1930s, and feature a Scottish terrier dog, and Art Deco design. At the time, the breed was steadily becoming a favourite, linked to American President Franklin Roosevelt owning one, which spread into popular culture when Monopoly was first created in the 1930s; the dog was featured as a player token. Here are a few from our collection. More are currently on display at the Maple Ridge Library, in the front display area until January 2. 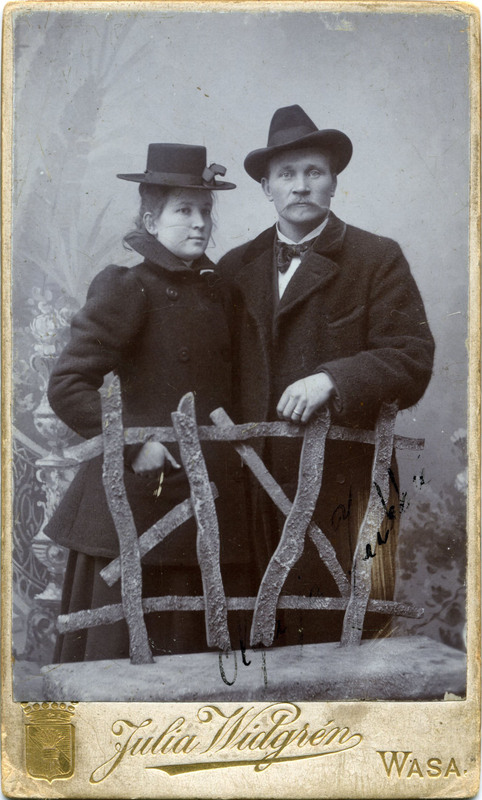 P13173: Finnish families from Webster’s Corners sailed from Canada for Petroskoi in the Nordic region of Karelia. They hoped to escape the Depression by building a communal society in the countryside (1932). The 1920s had been a decade of growth in Maple Ridge. The footprint of agriculture was expanded as developer’s reclaimed low-lying land with dykes and ditches. Meanwhile the riverfront was active with sawmills and the fishing fleets at Albion and Katzie. To the north the Abernethy Lougheed Logging Company moved into new timber limits and proceeded to remove hundreds of millions of feet board measure of timber between 1921 and 1930. The stock market crash in October 1929 quickly evaporated Allco’s American financing, leading to the layoff of hundreds of men in a town with a permanent population of only 4,000. Weakening markets affected milling. By the middle of October 1930 the mill at Port Hammond, one of the largest in Canada, was closed until the times could improve. Between 1930 and 1933 it would stop work at least four times for months. By the end of 1931 British Columbia’s unemployment rate was heading towards 30% because of the collapse of natural resource industries. Unlike on the Prairies, where drought in the latter half of the thirties caused depopulation of rural areas, farmers in Maple Ridge held on to urban markets for milk and fruit. The Port Haney Brick Company likewise remained intact. Employing as many as 50 people, it shifted from the production of bricks to the production of agricultural piping. Locally, the political scene was dominated by Solomon Mussallem, who was reelected as mayor nine of ten times between 1929 and 1939. Provincially, the district was represented by Conservative cabinet minister Nelson Lougheed from 1928-1933. 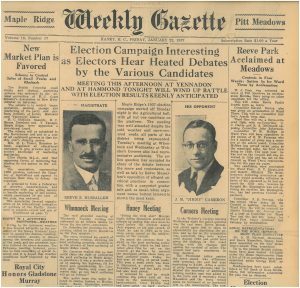 The Conservatives were swept from the legislature in 1933 as the province responded to Liberal Duff Pattullo’s call for “Work and Wages”. By the end of 1930, it was becoming clear that high unemployment was structural. Municipalities could apply for “relief work” funds but were at the mercy of the provincial Ministers of Labour and Public Works, to whom they had to submit evidence of serious unemployment. The money was spent almost exclusively on the labour portion of public works projects: in Maple Ridge, Mussallem’s first effort was to deliver a water and sewer system to Hammond. The Depression challenged traditional family roles. Many women who had entered the clerical and administrative workforce during the 1920s felt social pressure to give up their employment to create space for men, a phenomenon that would recur at the end of the Second World War. Some jobs, like commercial packing of fish and fruit, remained “women’s work”. Political action during the Depression demonstrated to children only the loudest voices are heard. The students of Maple Ridge went on strike in April 1939 to demand the construction of a modern high school. Many local administrators—and even many parents—were appalled by what they saw as an act of disrespect. The walkout received national attention and garnered meetings between the Ministry of Education and the local council. In 1940 a bond measure backed by an increment on the school tax—previously rejected four times—was passed by referendum, suggesting many adults had rethought their opposition. Culturally, the town’s celebrations were joined by new mass entertainments like the cinema—adapted to a rural setting. The church continued to be an important feature of community life. Baseball, long encouraged in Maple Ridge by mill manager Doan Hartnell, was the community’s most beloved sport. Improvements to the field at Hammond and a new ballpark in Pitt Meadows were some of the few investments in local parks made during the Depression. The long decade of the Depression was finally ended by world war, which produced huge demand for Canada’s natural and human resources. In the 1870s, the growth of ranching on the middle Fraser and Lillooet rivers was stymied by a lack of access to the most important market for meat: the Canadian Pacific Railway construction crews. Cattle were driven to their purchasers for butchering. To facilitate their overland travel, the young province of British Columbia explored the Coast Mountains between Pemberton and the Lower Mainland for possible routes. One of these pathways began on the flats of the Alouette, then called Lillooet River, in Pitt Meadows. Although the country between the headwaters of the Alouette and the (Pemberton) Lillooet rivers was very rugged, the Katzie and Lil’wat nations had long engaged in trade of goods and kin along a historic trail that cut between the Alouette, Stave, and Lillooet watersheds. The following letter was submitted by a government surveyor to the provincial official responsible for lands. The route described was not chosen for the Lillooet Cattle Trail, which eventually had a short life via Squamish, but helps explain the naming of the two Lillooet rivers. In accordance with you instructions I have explored from Pitt Meadows, in the direction of Pemberton Meadows and have hereinwith forwarded a rough sketch, giving altitudes, and approximate distances. I am confident that this is the only practical route from Pitt Meadows. All the passes from the head of Pitt Lake being as high if not higher, and the heavy expenses in constructing a trail around Pitt Lake would preclude that route from being adopted. The cost of constructing a trail by the route marked in red and yellow will be about the average of trail making in the mountains (probably a small percentage lower) part being very heavy and expensive, while by far the greater portion being easy of construction. There are two summits to cross, the first 1225 feet; 2nd 2950 feet. The descent of the first summit to Stave Lake, very steep and rocky. The last ½ mile of the ascent from Stave River to the 2nd summit, also very steep and rocky. The descent to the mouth for ½ a mile is steep but not rocky. The altitude of the route marked in yellow is about the same as the one marked in red, if not higher. The reason I did not explore this line through was that when at an altitude of 2000 feet, the pass then being very steep and rocky, continued so as far as we could see from the mountain side. IO came to the conclusion that this could not be the pas spoken of by an old Indian as being so low of altitude and easy of ascent. I then returned and explored the main valley, and continued the red line route. 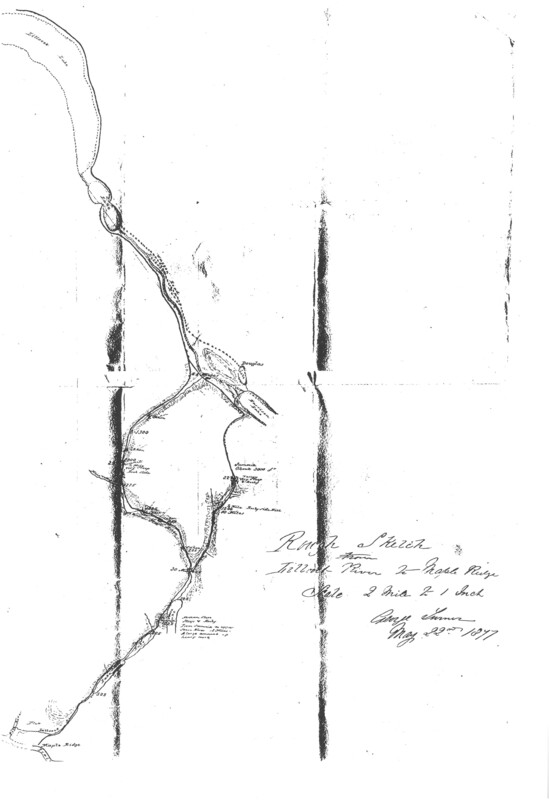 I am confident the pass is as high if not higher [sic] than the red line, but should it be decided to construct a trail in this direction, I would advise that this pass be examined through and compared with the other for distance, cost of construction &c.
It will be impracticable to cross the Lillooet River so as to make the present waggon [sic] road from Douglas available, the current being so swift that it would be dangerous to swim cattle across. I did not examine the route any further than about 10 miles above its intersection with the Lillooet River, but from information I am satisfied that there are no serious difficulties to contend with in constructing a trail around Lillooet Lake to the waggon-road [sic]. The only feed worth mentioning is at the head of Stave Lake, that being limited. There are two Beaver meadows, one about 5 miles from the second summit, the other on the summit. The distance from Maple Ridge to Pemberton is about 125 miles, and the total distance from Maple Ridge to Lillooet is 190 miles about. What were Maple Ridge’s two cooperative settlements? · 1896c – “Canadian Co-operative Society” enters four acres of Twigg land at confluence of Stave and Fraser Rivers. ·1900c: Kurrika and other Finnish socialists arrive on Malcolm Island. Sointula: “Haven of Harmony”·1904: distintegration of the Sointula group after indebtedness cannot be cured, dissatisfaction with the land’s productivity, fire in one of the communal dwellings kills eleven. · Association formed: the “Sammon Takojat” (meaning forgers of the place of the Sampo). Begin shingle bolt cutting, opportunistic fishing season. ·Raise capital to purchase 159 acres around Webster’s Corners school. Price $2,700. Name compound “Sampola”: haven of the Sampo. What distinguishes cooperative settlement from typical settlement patterns of the era? Cooperative settlement is based on the idea of the supremacy of “the commons”. What this means is that the community interest is considered more important than the will and interest of an individual within that community. The labour and resources of each member of the settlement may be shared in a variety of ways. In a true cooperative, the surplus or debt of the community resulting from its activities is shared by all members. Cooperative settlements come in degrees: in some, fully communal settlements, all members live and work together, while in others each family may live separately and keep private possessions. The crucial element distinguishing cooperative settlement from settlement under the provincial and federal land acts is that members of a cooperative association agree to pool most or all of the benefits of their labour for community purposes. Both examples of cooperative settlement in Maple Ridge evoked aspects of “utopian socialism”: a philosophical movement influenced by progressive Christianity in northern Europe from the 16th century on. Who chose to settle cooperatively? Maple Ridge hosted two cooperative settlements around the turn of the twentieth century. These settlements were located in Ruskin (circa 1896—1899) and Webster’s Corners (1905—1913). At Ruskin, the settlers were English-speaking members of a limited company formed to run a sawmill on the Stave River. At Webster’s Corners, Finnish-speaking immigrants set up a cooperative society, the Sammon Takojat, to work a quarter-section farm, the Sampola. The name “Sammon Takojat” loosely translates as “forgers of the place of the Sampo”, while Sampola means “haven of the Sampo”. The Sampo is a vessel of good fortune in Finnish mythology, which in the epic poem Kalevala is presented as a mill that could produce grain, salt, and gold magically. Why did they choose this? The name chosen for the Stave River settlement, “Ruskin”, was a poor fit for the milling enterprise undertaken there. Named in honour of John Ruskin (1819-1900), the English art and social critic, the heavy equipment used by the mill belied its namesake’s call for a restructured agrarian society where technological progress and heavy industry would be suspect. The fact that the Ruskin settlers knew to set up their operation as a limited company may suggest they were familiar with cooperative living strategies and had come from a similar settlement elsewhere. The growth of socialism in Europe as a response to the inhumane working conditions of the Industrial Revolution had spilled into North America, and a great variety of cooperative settlements had sprung up throughout eastern Canada and the United States. Although many such communities were founded by religious minorities who faced discrimination in society at large, others were based on political socialism with implied affiliations to a mainline denomination of Christianity or without official religious affiliation. The Sampola commune at Webster’s Corners was based on cooperative labour guided by leader Matti Kurikka. The settlers and Kurikka had fractured from a similar cooperative community at Sointula, on Malcolm Island, where in 1904 a devastating fire had killed eleven living in communal housing. The Sointula commune was reportedly indebted and the loss of so many members tipped its disintegration. Looking for new opportunities, Kurikka led other committed socialists to a defunct shingle camp in the outskirts of the Maple Ridge municipality. Taking a contract to log, the group set to work, hoping to generate enough money to purchase a farm property. The Lutheran-influenced socialism prevalent in Scandinavia did not advocate violent revolution against entrenched wealth, as did the “scientific socialism” famously proposed by Marx and Engels. Instead, “utopian” socialists, many of them Christians, proposed that the ethical and economic strength of the society they envisioned would gradually and reasonably convince all communities to strive toward it. Cooperative settlements in the rural hinterland of North America evinced this form of socialism by making demonstrations of an ideal without inconveniencing or challenging the order of property and wealth in settled areas. This pattern repeated itself widely in North America during the 19th century as European settlement generally trended westward. Whether or not such a community was religious, all cooperative settlements were motivated by a belief in the reward of sharing resources and placing some limitations on private initiative and property. How did the cooperative settlement function? The settlers at Ruskin formed a limited company, named the Canadian Cooperative Society, in which each member was awarded an equal number of shares. This legally gave members of the society equal weight in deciding the direction of the company at its meetings and made each equally liable for losses and gains made by the company. The company was intended to make enough profit from the sale of milled timber to operate a school for its families’ children and a store where its members could supply their homes. Housing was not communal, but all families lived on the four-acre property surrounding the mill site. It is unclear if the land was rented from or donated to the settlers by the landowner, a Mr. Twigg. The company mortgaged its equipment and issued its own scrip to keep employee wages at the company store. The community erected a schoolhouse for its children on the mill site in 1897. When this was soon found unsatisfactory, neighbour Charles Whetham donated a piece of his land for it to be moved. The community had succeeded such that in 1898 it was awarded a post office. Unlike the earlier Ruskin settlement, the Sampola commune engaged in a broader range of activities and therefore placed greater emphasis on the self-sufficiency which characterizes utopianism. Members of the commune cut timber for shingles, raised poultry and livestock, mined gravel from the Kanaka, and occasionally fished the Fraser River in order to support their community and thus their families. The land for the Sampola commune was purchased from a settler for the sum of $2,700 – it totaled 159 acres and included frontage on Dewdney Trunk Road, the valley of upper Kanaka Creek, stands of mature cedar timber, and the existing barn and farmhouse. The area, called Webster’s Corners, was already the location of a handful of homesteads, a school, a post office, and store. The Sammon Takojat quickly went to work erecting cabins, shared, for its members and then delivered a large building incorporating its communal kitchen, dining hall, and sauna. How did the cooperative settlement end? What caused the end? Cooperative settlements were short-lived in Maple Ridge. The Canadian Cooperative Society at Ruskin was disbanded in 1899, only three years after its formation. The cause was reportedly a bad timber season on the Stave, which made the society default on its payments for the logging machinery. The mill site and equipment were possessed by the Heaps Logging Company of Vancouver, which reopened, expanded, and operated them in conjunction with a logging railway extending throughout the Ruskin and Whonnock areas. The Heaps enterprise had also failed by 1914. The Sammon Takojat, founded 1905, was disbanded voluntarily in 1913 when the population of Sampola had grown to the point the effort could no longer be self-sustaining. The access of the commune to resources like timber which supported their effort also diminished as settlement accelerated in the Webster’s Corners area and more land was occupied. The members of Sampola were each granted a portion of the commune to be disposed of as they wished. Many stayed in Webster’s Corners and continued to support Finnish cultural life and pro-labour politics there. The resilience of the community and its commitment to certain core ideals was demonstrated by the fundraising and construction of the Sampo Hall 1915-1916. The Finns of Webster’s Corners were also instrumental in setting up a communal waterworks to service the cluster of farms near the Kanaka and, starting in 1923, a consumers’ co-op which allowed them to buy and sell farm goods at wholesale prices. 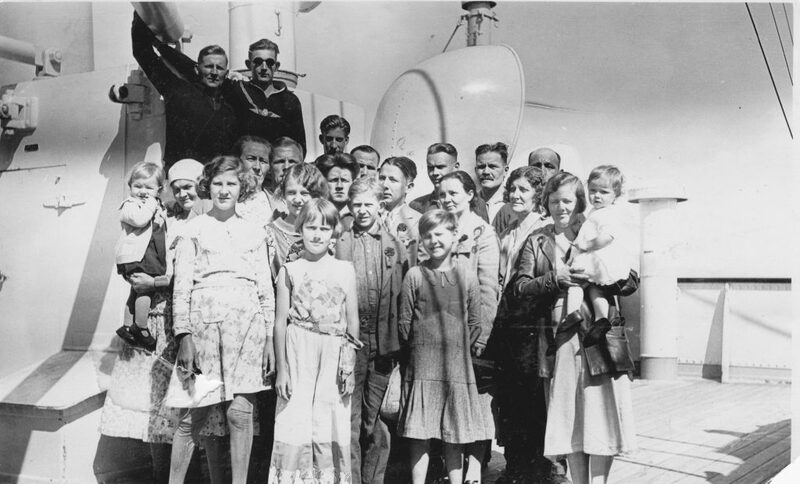 During the Depression, some Finnish emigres left Maple Ridge to pursue a utopian society being set up in Karelia, a northeastern province of Finland that was ceded to the Soviet Union in 1940. Are there lessons for us in this experimental way of living? The idea of cooperative settlement is at once easy and difficult to grasp. As a society we have deeply-held ideas about the implications of socialism and about the individualism and strength we imagine our ancestors demonstrated. It is important to remember that not all efforts to enter the land in Maple Ridge followed this rigid idea of “pioneer” independence. Nor did those private families believe or act as if they were totally alone on the landscape. The romance of independence and self-sufficiency was imaginary throughout Maple Ridge, which was mainly settled so that its natural resources could be developed and their products sold elsewhere. Cooperative effort, whether announced or implicit, was required to do this. In Webster’s Corners, cooperative ideas about society continued to hold and be expressed by the community that outlasted the commune. The people of cooperative settlements all expressed dissatisfaction with the ways and means of industrial society, and sought to correct what they saw as the harms inherent in it by vesting the benefits of economic activity in the community at large. In their dedication to community and promotion of work ethic, their values were not particularly different from our own. 1926 began with promise for the sons of Mossom Martin Boyd. Gardiner, Laurie, and Mossom deGrassi had inherited their father’s logging business and transformed it into a venture for timber speculation. Two decades before, their father had purchased the rights to log crown forest in the Maple Ridge Municipality. These lands, called timber berth Y1 and Y2 by the government, had been a hard sell. Located at the head of a mountain river valley, and partly flooded by a hydroelectric dam, the log lands were practically inaccessible after the neck of the valley had been occupied by a separate timberholder. The McCormick-Deering families of Chicago bought up the rights to log below Y, isolating it. Now, the McCormick’s contractor, Nelson Lougheed, had agreed to pay the Boyds and the Lamperts (timberholders on neighbouring timber berth Z) for their rights to log. Timber harvesting began in January, and by the end of the month two million feet board measure had been removed to the Fraser River. Lougheed was planning to cut 40 million in 1926 and 1927, expanding the harvest to 60-80 million feet board measure in 1928 and afterwards until the completion of the contract in 1931. 1927 would be the year of highest production on timber berths Y and Z, during which the Abernethy Lougheed Logging Company removed 83,799,875 feet board measure from the limits, including over 29 million feet board measure and nearly 39 million feet board measure of the valuable western redcedar and Douglas-fir respectively. In 1912, Clark and Lyford, the forest engineers, had estimated that on TB Y the average Douglas-fir tree contained 2500 feet board measure net, with cedars smaller at 1500 feet board measure. From these figures we can estimate that in 1927 Abernethy and Lougheed removed 15,600 Douglas-fir trees and 19,300 redcedars, in addition to felled trees of other species. The cut of all species totaled just over 67 million feet board measure in 1928, 43 million feet board measure in 1929, and just 4.5 million in the three months of operations in 1930. Added to the cut of less than 29 million board feet in 1926, the year after the signing of the contract between the Boyds, the Lamperts, and Lougheed, the total timber harvested by May 1930 was 227,465,928 feet board measure—representing roughly 49,600 redcedars, 42,000 Douglas-fir, and 33,200 western hemlocks plus a few thousand other specimens sent to the Fraser River mills. ND [1927-1929]. 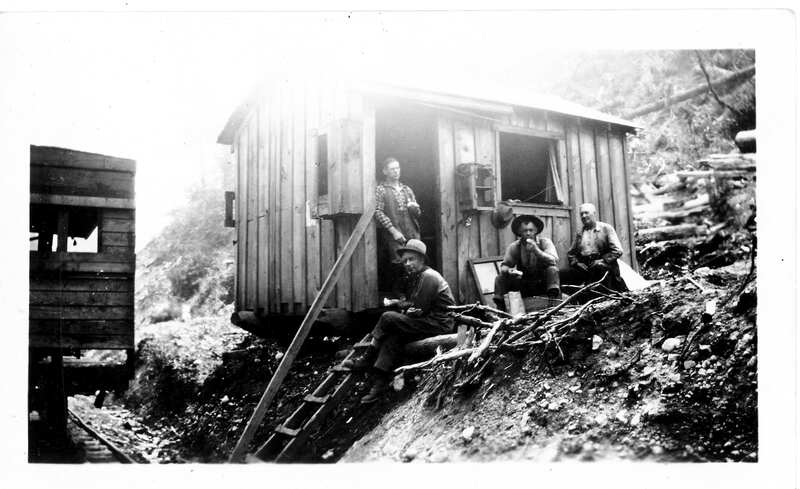 Men sitting at the “watchman’s shack” near the Gold Creek camp of the Abernethy Lougheed Logging Company. The Lower Gold Creek area was part of the lands contracted to Allco by the Lampert and Boyd family companies. Unfortunately, we can only guess at the value of these operations to Abernethy Lougheed. While the cut reports also total amounts paid to the Lamperts and the Boyds between 1926 and May 1930 under their agreement, these were payments in instalment for the right to log—quite different from payments for the logs themselves. Abernethy Lougheed’s business was to collect this latter payment by performing the harvesting and transportation of logs to the timber market. Historic prices for Douglas-fir logs on the market in North America, where BC softwood competed with lumber from Washington, Oregon, and the interior west, help indicate the value of the timber species most harvested by Abernethy Lougheed. Between 1926 and 1930, prices for coastal Douglas-fir sawlogs ranged between $15.00 and $16.00 per thousand feet board measure. In total, the Douglas-fir harvested by Abernethy Lougheed could have brought as much as $1,650,000 to be used by the company to pay the government, the timberholders, their employees, and their financial backers. Log prices did not remain at $15.00 per thousand feet board measure after 1930. In October of 1929, the stock market crash set the stage for a decade of hardship, during which demand for lumber and other commodities plummeted. By 1930 Nelson Lougheed had been elected to the provincial legislature and was serving as the Minister of Lands under the Conservative Simon Fraser Tolmie. The solvency of Abernethy Lougheed, and their ability to complete the contract with the Boyd family, did not appear to be directly in question on March 27, when Laurie informed Cust, “I have not seen Lougheed yet about Lilloet [sic], he was so taken up with the sittings of the House that he had no time to make an appointment and when the Session ended last Saturday he beat it off and got married and is, I understand, gone East on his honey-moon.” At most, the remark suggests the Boyds were concerned by the drastically reduced rate of cut on their timber berths, which Abernethy Lougheed continued to pay out until May. Owing depressed state lumber market unable secure money here meet timber payment. We have plenty of security and have offered substantial bonus unless your bank in Minneapolis or Toronto can assist. Must have reasonable extension meet your payments. ND [1921-1930]. Locomotive 55 bringing logs out of timber berths W, Y, and Z for the Abernethy and Lougheed Logging Co. Each train car carried in the thousands of “feet board measure”. The Boyds, who were more favourable to extension than the Lamperts, convinced the parties to meet in Vancouver at 9am on October 1st. The outcome of the meeting was not extension, but the development of “our rights under the Contract […] in a natural way”. Those rights allowed the Boyds and Lamperts to collect interest on the principal, and, if necessary, take possession of fixed assets belonging to the Abernethy Lougheed company and re-enter the timber berths. “We [the Lampert Lumber Company] would not execute those rights provided they would assure us that they would pay us 7% interest semi-annually, Feb. 1st and August 1st of each year, out of the proceeds of the rent which they will collect from the Dominion Government on the lease on the logging camp and providing they would assure us that they would continue to cut and liquidate remaining fixed assets as soon as general market conditions would permit them to do so without loss.” The logging camp referred to was none other than Abernethy Lougheed’s headquarters camp, “Allco”, which had been given under lease to the government as a relief work camp for vagrants. The Depression had set in badly, and unemployment in British Columbia in the summer of 1931 was edging steadily towards 25%. Privately, Lampert leaned towards legal action—wishing to repossess the timber limits, which Gardiner believed were of little value, or the machinery used by the company. A balance sheet for December 31, 1931 forwarded to the creditors by Sutherland in April showed assets of over $775,000 in second mortgage bonds on the “Edgar-Lougheed Company”, given in return for the company’s use of Abernethy and Lougheed machinery. When the operation defaulted on its own timber mortgage in the United States, Abernethy Lougheed went to court to disentangle their equipment from the reach of the Edgar-Lougheed Company’s primary mortgage holders, who were also demanding payment. Approached by Lawson, the solicitor for the Boyds and Lamperts, for information, bookkeeper Sutherland reported any legal proceedings against the Abernethy Lougheed Logging Co. would force him to declare the company’s bankruptcy. By the summer of 1933, fees in default on TB Z totaled $6,596.21, and on TB Y $1,845.50. As a year had passed with no visible progress, Lampert again pressed in June 1932 for legal action. Lampert wished to ensure that the logging equipment, if it could be returned to the books of A&L, would become a frozen asset to be claimed by the timberholders in lieu of their $80,000 balance forward. The idea of reclaiming the timber berths and evicting A&L, who had never been transferred the government timber license, was anathema to the timber holders. Firstly, the lands were now extensively logged—Cust estimated all of the merchantable timber on Y1, Y2, and Z1 had been removed—meaning they were of uncertain value. Secondly, they were not liquid—meaning they had no cash potential unless the economy and the regrowth of the forest could dramatically restore them. Thirdly, maintaining them required paying government fees and pouring money into timber operations with dim prospects. ND [1926-30]. 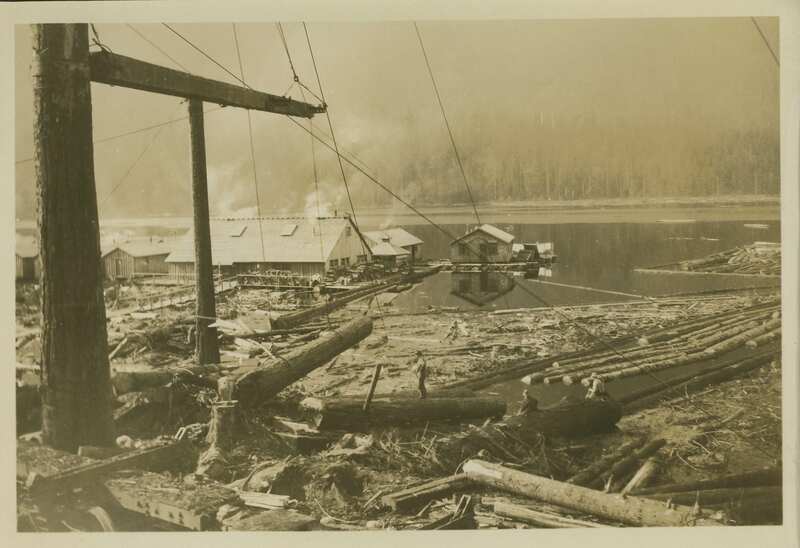 Logs from timber berths Y1 and Y2 at the top of Alouette Lake were boomed and floated to the logging railway. Several dozen thousand trees were removed from the Alouette Lake area by water and rail. This left the timber license holders with three options: put Abernethy Lougheed into receivership, take judgement against the company for the amount of the unpaid balance with interest, or repossess the timber limits. None were palatable. The first course of action would require extensive litigation that no party thought advisable. The second would only pay out if Abernethy Lougheed could recover their machinery from the Miami Corporation and use it to generate revenue by logging. The third course would provide no relief from fees in default and deed the Boyds and Lamperts worthless, denuded lands. The timberholders took no action. Eventually, the government cancelled $40,000 owed to it by the Abernethy Lougheed Logging Company in exchange for cancelling the company’s timber license in berth W, where the land would be preserved for park purposes. With no hope of reclaiming any amount from Abernethy Lougheed, the Boyds and Lamperts contracted with the Crown to cancel their outstanding timber license dues in return for cancelling the licenses after 1943. Together the timber berths in Maple Ridge Municipality formed the basis for a new provincial protected area, today Golden Ears Park. 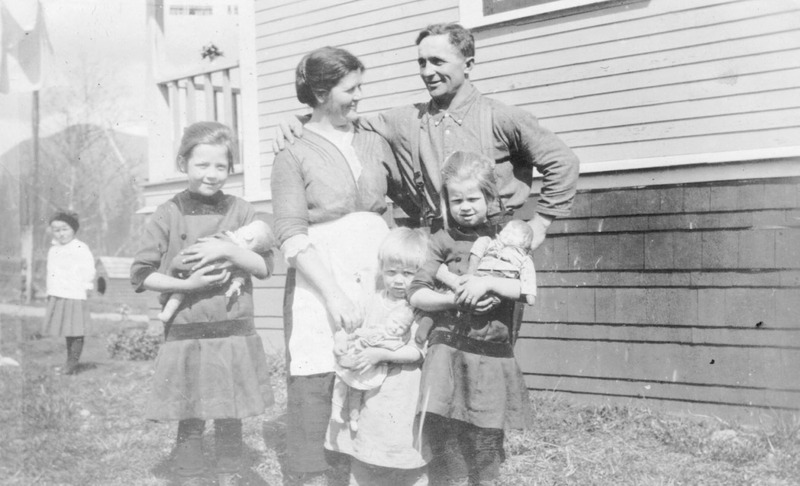 On this day, June 18, in 1910, you too could have “A Happy Family on a Whonnock Farm”. Just call Rogers and Black, real estate agents of Vancouver, to ask about their divided acreages and beautiful country homes. Ed Watson was no advertiser’s myth – he and wife Annie Major moved to Whonnock circa 1890 and raised their nine children on acreage near 272nd Street. 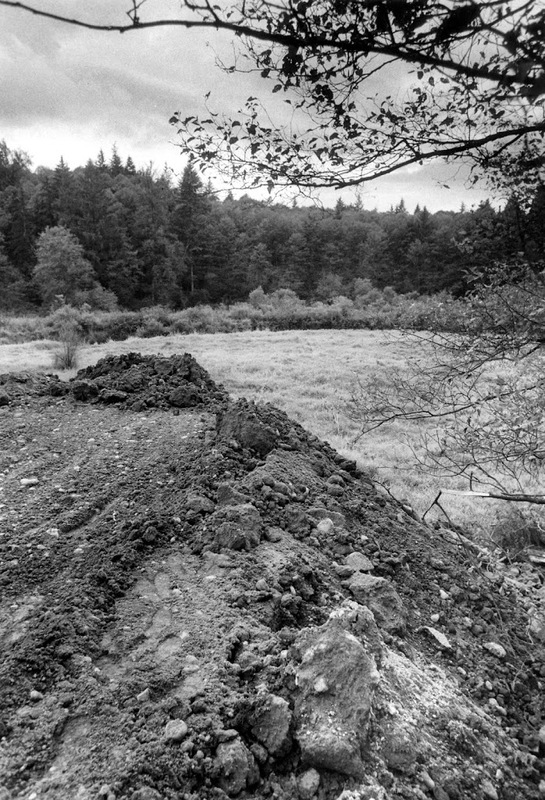 Farming in Whonnock was, contrary to Watson’s testimony, hard work because of thin topsoil. Subdivided acreages in such areas were popular rural retreats for those who maintained small, non-commercial farms in addition to other employment. This notice, appearing in the Vancouver Daily Province, was published two years in advance of an electric railway scheme for the north Fraser Valley that would see the papers trumpeting upland properties in Maple Ridge of 5-10 acres. The character of Whonnock is essentially the same today: small acreages where families could retreat from the workday in town. It was a bad fall in Maple Ridge in 1929. The Abernethy and Lougheed Logging Company, local pride and powerhouse, had tumbled into insolvency as its financing evaporated. Allco’s seven camps were shuttered, their population of hundreds put on the hunt for work. Autumn rain hit the barren slopes where logs, dragged down and out by high lines and steam engines, had demolished the forest understory. Now, water carried the slope down through widening runnels. The only labour left in the timber berth was tearing out the iron rails; ties, worthless, were left in the gravel roadbeds which curved through impoverished hillsides. Although there were other timber companies operating in the municipality’s hinterland, none were as large as Allco. Weakening markets for softwood affected milling, the major industry in the town sites. By the middle of December, the mill at Port Hammond, one of the largest in British Columbia, was closed until the times could improve. Between 1930 and 1933 it would stop work at least four times for months at a time. The depression hit Maple Ridge fast, and it hit some very hard. Today we often hear that local governments are the victims of “downloading”, meaning they shoulder increased responsibilities relative to their means. In response to crises, we believe higher levels of government should step up (and in) to offer benefits the local tax base can hardly afford. But after October, 1929, the municipality of Maple Ridge was asked by the public to provide more. Social welfare became the chief issue in the local election campaign of autumn 1929. Solomon Mussallem, a councillor of the good times, became the first Reeve of the bad. “Please reply if agreement been signed by Premier. Unemployment situation serious. Special meeting called tonight.” And, despite the situation’s gravity, Mussallem must have been somewhat happy to report to faces stricken with uncertainty that Lougheed had wired back promptly: “The agreement has been signed by Hon. the Premier [Tolmie] at 5 o’clock, and a copy will be mailed”. The agreement referred to by the pols was between the Province and the (federal) Dominion; it allowed the province to direct financial aid to projects benefitting unemployment. Municipalities were eligible to apply for these relief work funds, but were at the mercy of the Ministers of Labour and Public Works, to whom they had to submit evidence of a serious unemployment situation. The Unemployment Relief Act of 1930 left “evidence” and “serious” undefined, so the Minister was under no obligation to disburse money. The money was spent almost exclusively on the labor portion of municipal public works projects; in Maple Ridge, Mussallem’s first effort was to deliver a water and sewer system to Hammond. Other projects were to construct new bridges over Kanaka Creek in Albion and Webster’s Corners, and multiple road gradings and pavings. Municipalities were left to hire the labour and front applications to the fund, as well as find financing for project materials and machines. The financing ratio changed year by year as the relief legislation expired and was renewed. Between 1930 and 1933, the higher governments would front two-thirds of project costs; this rate was reduced to 60/40 in 1933. More than ever, it became essential to have an ear in Victoria. Reeve Mussallem, and many other local politicians, travelled to the capital frequently on the new public business of negotiating for relief work. Relief work was no political goldmine. Mayors and councils, given great discretion to pursue works projects, came under significant pressure to deliver them. Higher governments set conditions that caused political difficulties for local pols. Originally, “transients” and “single men” were payable from the relief work funds to 100% — keeping them off the municipal balance sheet – while the local men, often farmers or contractors in sawmills with families, were paid partly from the municipal purse. Local politicians were incensed when the provincial government reduced the ratio it would pay for transients to two-thirds in 1933, because councils preferred to keep relief work contracts for hometown voters. The compromise reached between Mussallem and Victoria allowed that the province would continue to pay the full wage for anyone residing in Maple Ridge for the lesser part of two years. Despite this, the provincial purse typically remained shut to the municipality until the provincial liability could be detailed in the finest print. When Mussallem was notified at the end of 1930 that Maple Ridge would receive $14,000 to pay the labour for its Hammond sewer system, he protested to Minister Lougheed that the amount was altogether too small. The Reeve was chastened by Lougheed’s response: “You sign this agreement, and if that is not enough for you, you can make another application, and, in all probability, you will receive more.” In chambers Mussallem would simply “recommend that this Council go on record as being grateful to the Honorable Minister of Public Works”. The relationship between the municipality and the province was often sour: the province was in a position to grant or withhold money, but the Reeve and council were the ones first to be accused of failure if relief fell through. Other civic action groups strongly supported the direct intervention of the federal government in social issues. 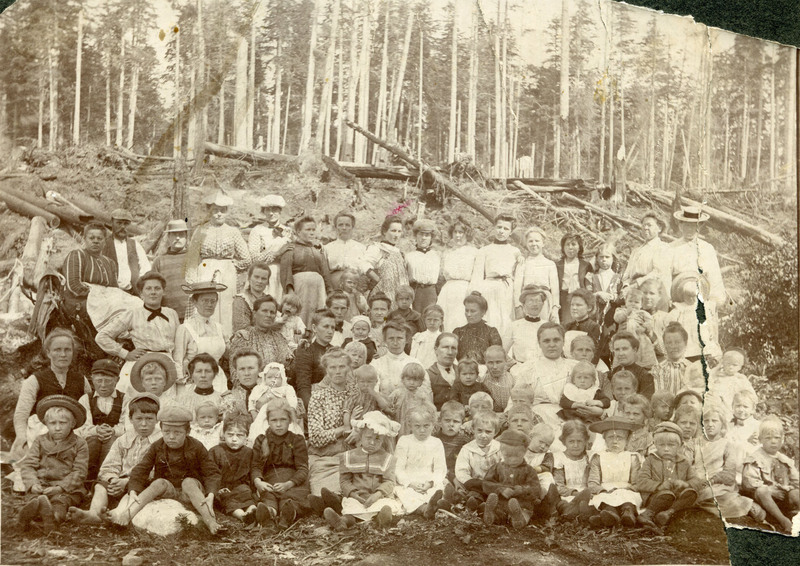 Founded in 1932, the Maple Ridge Unemployed Citizens League declared to “unite the individual efforts and strength of all unemployed citizens of Maple Ridge under one efficient control and direction, and to obtain immediate relief and the necessities of life including food, clothing, shelter and medical attention for all destitute citizens”. At the organization’s second meeting, councillor James Cameron, who sympathized with the social democratic politics of the Cooperative Commonwealth Federation, announced his hope that “those who are in a position to help see the need of their sharing [and] that the principle of profit must be eliminated before a true solution can be reached.” Alternative politics drew increasing support but alarmed many of the independent businessmen who considered themselves the town’s caretakers and were the most frequent candidates for local office. Most often, they wanted assistance from higher governments but also the right to determine how such assistance would be spent. The relief work programs raised many issues, especially around fairness. In a town of only a few thousand, the family men who benefitted most from the relief work programs could be well-connected with their ward councillors, who were also the employers and paymasters on relief work projects. Disputes on Council arose when Reeve Mussallem occasionally refused to endorse a paycheque for relief work on the basis that the work had been performed badly or not at all. In one case, a payee threatened to sue the municipality for breach of the contract between the payee and his Council member. Mussallem was forced to stand down; lacking evidence there had been any legal wrongdoing, in spite of his observation that the work performed “could be done in considerably less time than was taken”. The closeness between municipal politicians and their communities and the high amount of discretion exercised over the relief work program made transparency and fairness in the disbursal of funds difficult to achieve. Letters to the Maple Ridge – Pitt Meadows Gazette complained that the family of public officials and “farmers with well-stocked barns, granaries and roothouses” were picking up relief work contracts while “those whom the government had planned to aid will be left in hardship”. There was one kind of labour discrimination everyone could agree on. As economic conditions improved for some, the public focused on the relief work “loafer”, something of a straw man designed to attack the assortment of transient labourers who were considered vagrant. The wages paid by the “relief scale” in Maple Ridge, up to $3.50 per day, were not especially generous, but because the work was targeted at family men relief work wages were typically higher than those under alternate public employment schemes. For example, in 1935, men on relief work in Maple Ridge were earning 40 cents per hour, while the province was paying young single men $1.75 per day – minus 75 cents for room and board – to join work crews in remote areas. The Port Haney Brick Company had a reputation as a gathering point for some of those labourers who were excluded or discouraged from municipal public works projects. The company’s trackside factory weathered the Depression with few work stoppages by picking up contracts to supply some of the new subsidized works. With large industrial kilns remaining warm long after the work day, the brickyard sheds offered respite to the homeless unemployed. Managers Harold Burnet and Jim Hadgkiss tolerated the guests so long as the site remained tidy. By some accounts, the visitors were well-organized, making arrangements with Haney bakers and butchers to take away unsold (or unsaleable) stock at day’s end. Many during the Depression refused to take food without performing chores in return. Simmering anxieties about vagrancy and welfare worthiness outlasted any episodes of charity. 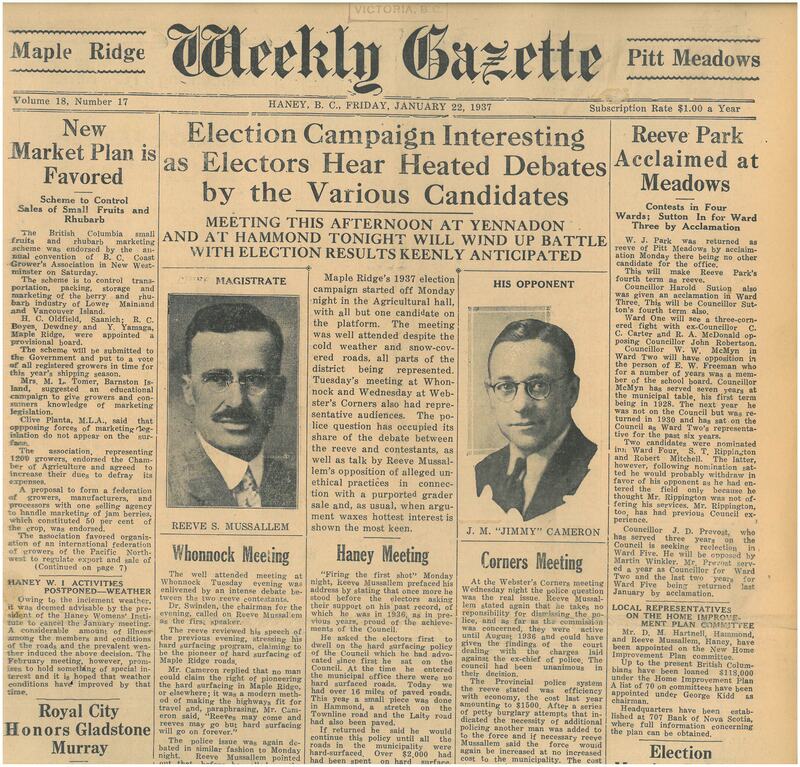 In 1937, when the labour organizer James Cameron ran against Mussallem for the Reeve’s chair, his campaign largely avoided his advocacy and connections with the social democratic CCF. Mussallem by this point had honed his message: predictable, pragmatic (some said “conservative”) government. The novice Reeve, by default, had become the only one with any experience squeezing money from Victoria. Mussallem took all polling stations except Hammond and Webster’s Corners, where the margins for Cameron decreased from those for the opposition candidate in the prior election. The family men looked on with relief. This week in 1931, Dr. Francis Joseph Buckley, of Haney, was cleared of the charge of manslaughter in the case of John Connely, a depression-era rail-rider. A sad case, in which the coroner found that Connely had died from alcohol poisoning. The brucine-laced “wood alcohol” was allegedly purchased by Buckley in Hammond, where Buckley had taken Connely and traveller Herbert Brown to buy food. Brown testified that it was common for Connely to drink the denatured liquor, normally reserved for industrial applications. Vagrants commonly stayed in Maple Ridge during the worst winters of the Depression, where they were allowed by management at the Port Haney Brick Company to sleep in the warm kiln sheds. Kanaka Creek is a small river that enters the Fraser in Albion. It descends from Blue Mountain through a series of forested ravines until it meets the level of the Fraser near 240th Street. Then the Kanaka meanders through wetlands and floodplain forest to its mouth. Long respected for its bounty of salmon, game, and plants, Kanaka Creek has also been appreciated for its scenic beauty. 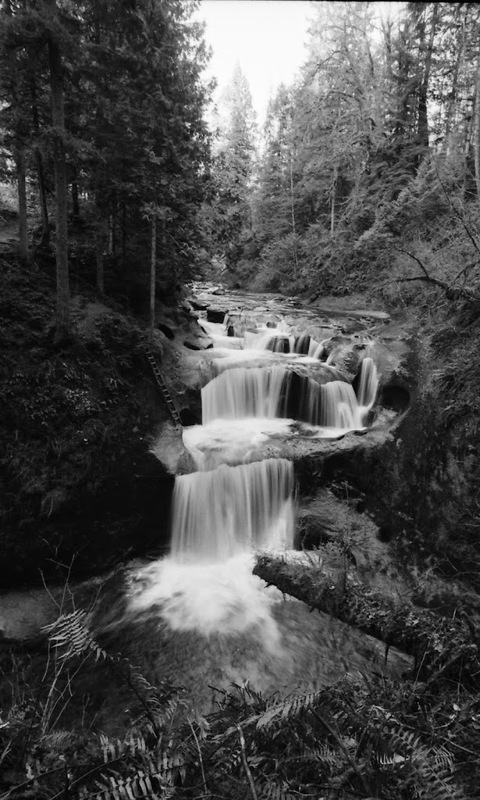 Aboriginal people and European settlers visited the dramatic waterfalls now at Cliff Park. While farms encroached on the river on its flats, disturbances along the upper reaches of the stream came from fishing and the use of the spring freshet to push sawn timber down to the Fraser. Light population kept the river’s riparian area mostly intact, despite being subject to human use. held. Today it runs on public lands from the Fraser River to Blue Mountain. The transformation of the Kanaka’s rural landscape into a suburban one began after the Second World War. Even though the population density of the area remained relatively low, the popularity of the car allowed urban housing to push onto rural sites. Retreats and family estates were carved out of the 160-acre farm allotments. These square parcels had always been impractical in this area of rolling hills and steeply cut ravines, where they often included inaccessible corners isolated by swift streams. Subdivided and used for housing, the lots including the thickly-forested creek valley made living in this area scenic and attractive. Subdivision confirmed that most of the river lay in private hands. Beginning early on in this phase of suburban growth, the regional planning authority laid out priorities for protecting and acquiring natural and recreational areas of significance. In 1966, regional planners with Vancouver-Fraser Park District, predecessor of today’s regional parks system, selected the watershed of the Kanaka as one such area. 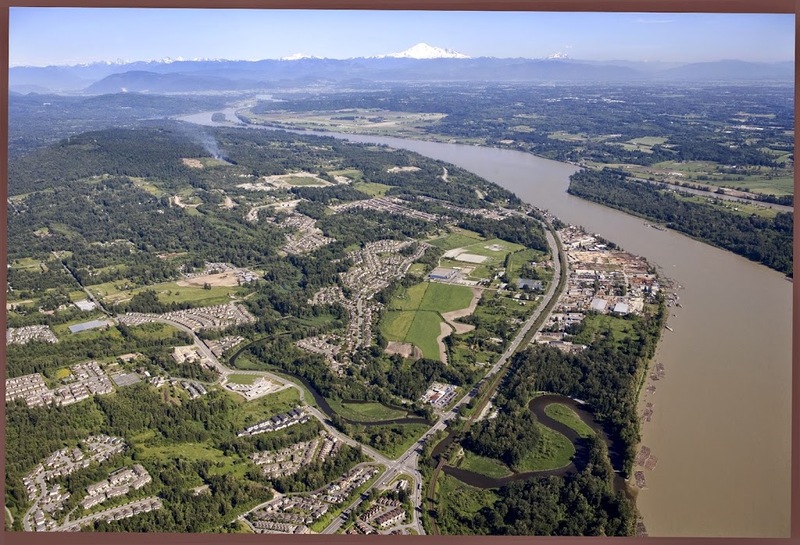 When the municipality of Maple Ridge entered this system in 1972, the Greater Vancouver Regional District began assembling properties along the course of the Kanaka, beginning with those that were already held by other levels of government. The concept was to deliver a “linear park” that could offer recreational hiking, fishing, and other activities to the public while preserving the creek’s ecosystems. To do this, the regional district required a vote on its financial plan for acquiring the portions of the Kanaka watershed that were held privately. At a meeting of the board on April 26, 1972, Kanaka Creek was one of many parks in the Lower Mainland where $860,000 was allotted for land purchases. The board also approved a by-law to authorize the borrowing of up to $5,000,000 for future parkland acquisition. The flow of public opinion on the park proposal turned into a torrent when, in 1977, leaked details about purchase negotiations suggested the regional district’s strategy was to accelerate property acquisition, which many interpreted as implying expropriation of lands. One property owner, Jeff Tarris, gave fuel to the newly organized “Kanaka Creek Residents’ Association when he received a letter from the GVRD which he said implied expropriation would be considered for his property within three to five years. Expropriation was not explicitly mentioned. Plans showed that the park would infringe on 191 privately-held properties and completely enclosed 35 homes. This inflamed property owners–and some elected officials on the regional district board such as Vancouver councillor May Brown, who claimed the board had not been made aware by planning staff that many of the properties to be acquired had already been built upon. P13172. ND. 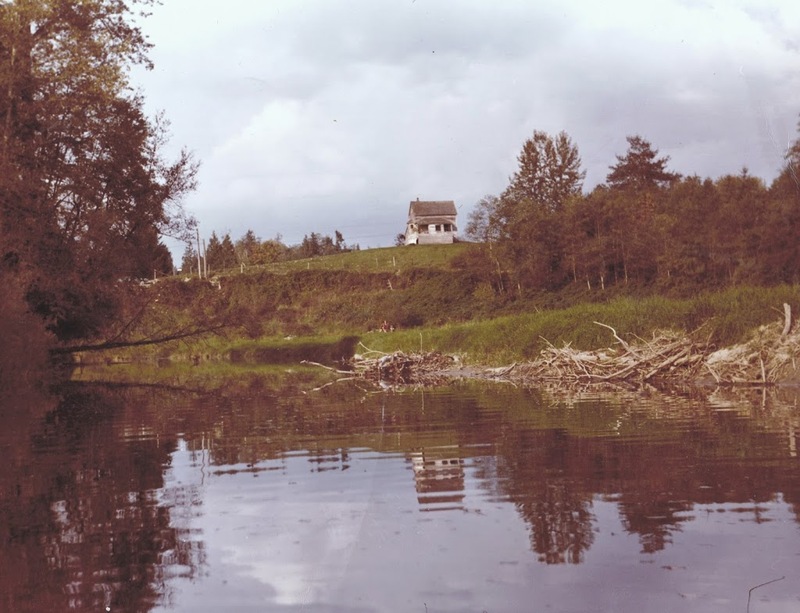 Seen from a canoe, the McVeety House was one of many rural properties that technically owned portions of the creek. Farming led to early observable impacts on the creek and its banks, such as increased erosion. 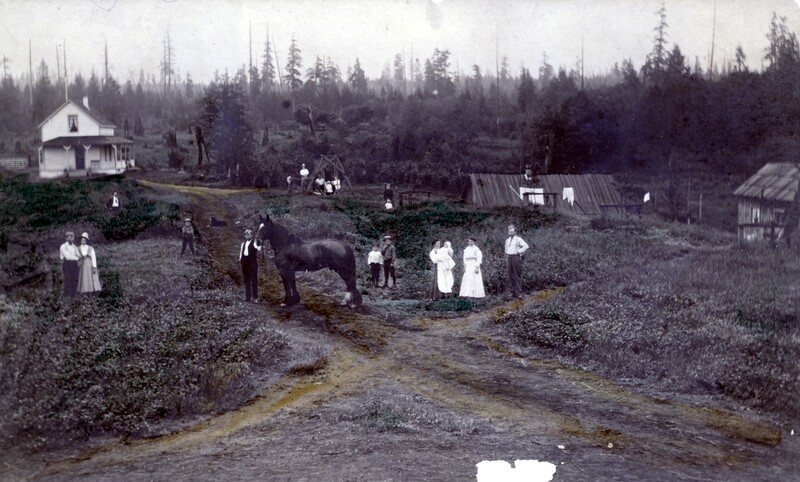 While some property owners supported the designation of a “Greenbelt”, under which their lands in the Kanaka’s riparian area would be subject to a restrictive covenant prohibiting their disturbance, yet would remain off-limits to the public; other residents of the Kanaka watershed proposed changing the park proposal to achieve ecological protection and recreational potential, and satisfy private property interests. There was disagreement on the effectiveness of all proposals: the Greenbelt idea required compensation for property holders without providing any recreational benefit to the public–a clear mandate of the GVRD–while the modified park proposal appeared to only weakly protect the creek’s environmental value. Planning staff with the regional district repeatedly claimed they had no intention of expropriation–except under circumstances where soil dumping and other activities on private lands were urgently threatening the quality of the creek, or where–according to regional planner Rick Hankin–“excessive costs would result from private development”. Residents of the Kanaka watershed were left anxious and unsatisfied when Hankin failed to elaborate on the nature of “excessive costs” in defense of the park program. Many local residents and members of the Kanaka Creek Residents’ Association, as well as GVRD board members, blamed the municipality of Maple Ridge for the public relations crisis. After all, many of the area’s residents had purchased property in the Kanaka basin after 1972, when the intent to acquire property in the area became public record. It was felt by property owners that the municipality had failed to disclose the park plan even as it had continued to approve building permits and rezoning applications within the boundaries of the future park. These approvals continued until March 1977, when the municipality was also chastised in an April meeting of the GVRD board. Eyebrows were further raised when local councillor and Maple Ridge’s representative at the regional district, Don Boyce, along with several family members and colleagues, was revealed to have purchased plots of land in 1976 that would acquired and compensated under the park proposal. No illegality was implied. Boyce recused himself from later decisions on the future park lands, though he maintained there was no conflict of interest. As consensus widened around the need to protect the creek’s ecological health, and park boundaries were redrawn to affect fewer properties, support for the GVRD’s public-access park concept prevailed in the community and at city hall. In September 1981, the regional district expropriated seven acres on the lower Kanaka to prevent soil dumping on the creek’s foreshore. Then, in the spring of 1982, consultation between Maple Ridge, the regional district, and the Kanaka Creek Residents’ Association allowed planner Ron Boyes to call meetings between regional district and property owners for the purpose of negotiating purchase agreements. The municipality also agreed to disallow or reject any subdivision and rezoning applications that affected “undevelopable lands” within the Kanaka Creek ravine and floodplain. By this time, portions of the park that had been owned by other governments were accepting visitors, as at Cliff Falls and the 256th Street entrance. The last major portion of Kanaka Creek Regional Park was opened in 1993, when the riverfront was purchased from New Zealand-based forestry company Fletcher Challenge. The site, nearly 160 acres in size, cost the regional district and municipality $1.8 million. Acquisition of small parcels in the Cliff Falls area continued into the 2000s. In total, just over $13,000,000 were spent by the regional district and the municipality to preserve this vital green space–the cost of making the Kanaka public.